Oh wow, thanks for the references! I wasn't aware about the Carno hand orientation. I knew that it was all sorts of messed up, since his forearm looks to be fused with his wrist and all we really see of an arm is his upper arm, but I didn't know the hands were more pronated. "...the shaft of the radius of Carnotaurus does not cross over the ulna but is lateral to and parallel to the ulna. As noted by Bonaparte et al. (1990), this reorients the hand of Carnotaurus such that digit I is lateral and digit IV is medial. This makes the palm face cranially..."
Just to clarify, "Lateral" means to the side, while "medial" means towards the middle. So in the quote is he saying the manus would be oriented to the supinated condition or semi-supinated or neutral? Not to be dense really..but a visual aid would really help me out as a lot of the jargon is too technical for me. The basic idea is that dinosaur hands and arms were not as evolved as modern day animals. This means the manus posture would place the hands facing one another due to the positioning of the arms bones. The terms used, supinated=palms facing up, pronated=palms facing down, and neutral =palms facing towards each other. So to state the dinosaur hands were supinated would make them facing upwards or towards the face of the animal . Pronated palms face down and it is highly likely dinosaurs could pronate their hands. Neutral would place the hands opposing one another. So Carnotaurus's stubby little appendages had hands that angled up toward it's face ? In what position ? forward, neutral or back ? In this case, when we are talking about "supination" on Carnotaurus; we are referring to position of its lower arm bones (radius and ulna) not being crossed at all (often people refer this position as the "neutral" position). If you are looking at the first link that I sent ( http://www.2shared.com/document/nrzSFBC3/arms.html), there are five figures and four of them supinate (from left to right, the last one pronates). Imagine your hand position similar to the third and fourth figures from the left, and that is "exactly" how Carnotaurus's hands operated (with their palms facing almost directly to the front and only angled slightly to each other due to the curvature of their chest http://1.bp.blogspot.com/-nYIARsBNx4c/TtcGyQFbH6I/AAAAAAAAA20/rULyUdb-vHY/s1600/IMG_3743.JPG, see how the lower arm elements are kind of attached "side by side" to the upper arm (humerus)). If you took out the jargon from the quote; the first line says the lower arm bones are parallel to each other as described in Bonaparte's original paper (http://www.nhm.org/site/sites/default/files/pdf/contrib_science/CS416.pdf). The second line says the first finger is positioned to the side of the animal whereas the last finger becomes the innermost digit and is positioned towards the midline of the animal body. Therefore the palm is facing to the front. I thought the first link with the five figures (see above) was self explanatory enough. The abelisaurs elements (the first two figures from the left) are lined up with the human arms for comparison. Try to imagine a ball boy (from a tennis match) signaling the player that he has no tennis ball with him (the ball boy's palms would be facing to the front/player). My computer is being a pain regarding downloading files including viewing pdfs for some odd reason. That is unfortunate, yeah if you do get a chance to download and view them, then have a look at them first because I think these will help you visualize how these elements are put together. I would think that what has been said about the orientation is the most logical one, since we know that these animals can't actively rotate their hands due to the interlocking nature of the lower arm bones (radius and ulna), and we also know that these lower arm bones are running side by side to each other from the front. So their palms are facing to the front/forward and that is the only workable configuration you can have. Tell me what happens when the two lower arm bones (radius and ulna) are not crossed? Which way is your palms facing? 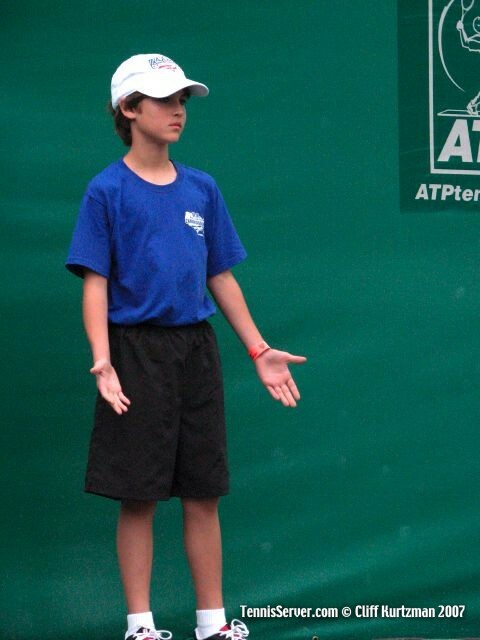 Here is an example of a ball boy showing he has no tennis ball with him (http://www2.tennisserver.com/images/Claycourts07/070413/IMG_5983sm.jpg). So like he's holding something basically ? Kinda odd since I know most theropods are " clappers " and not " slappers " . If the arms are positioned back out of the way like in the Sideshow statue or the newer Carnegie piece the palms would face downward to be correct then and both reconstructions are incorrect there. It's a lotta trouble over these tiny little guys..I appreciate the help though. Will help make mine all the more accurate when I get to him. While we are on the topic of arm posture, not sure whether you've seen this yet but here is an article (http://palaeo-electronica.org/content/2012-issue-3-articles/324-hadrosaurid-forearm) that you might be interested and it is probably relevant to your Parasaurolophus sculpture. 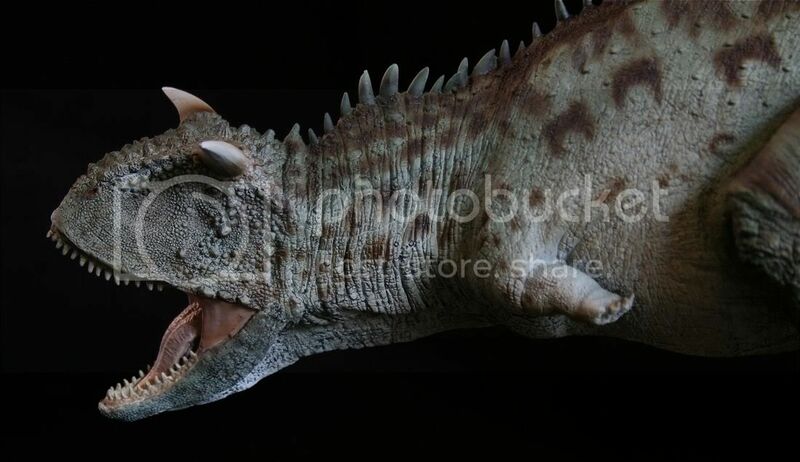 Wings, do you know of any artwork that illustrates this Carnotaurus forearm positioning? I'm having a hard time getting my head around it. Not at all! I'm considering it free education. And thank you for the hadrosaur paper! 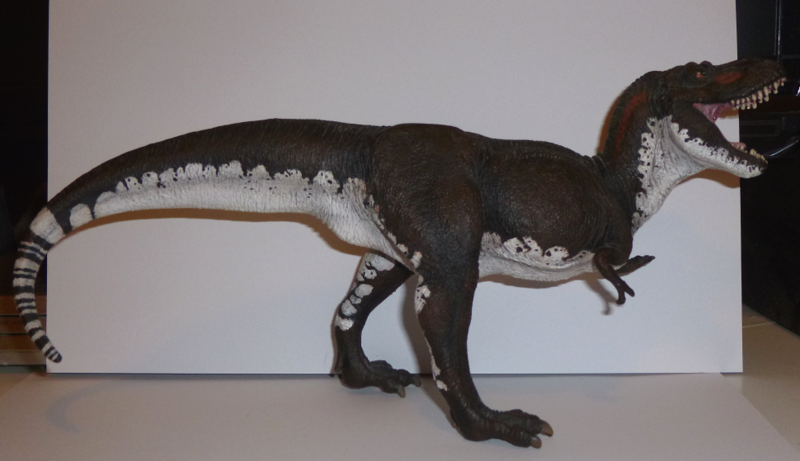 I think I may want to trouble you if there's any papers on juvenile parasaurolophus growth - I'm curious to know some thoughts behind their development. Wings, is this more or less how you're explaining it? I banged out a quick sketch to see if I got the gist of it. I also have a tendency to draw my Carnotaurus a bit tubby at times. If that is the case, then were his arms even more useless than I thought? I started to wonder towards the end of my sculpting if he could even flex his fingers. I'll have some more sculpts up soon too! 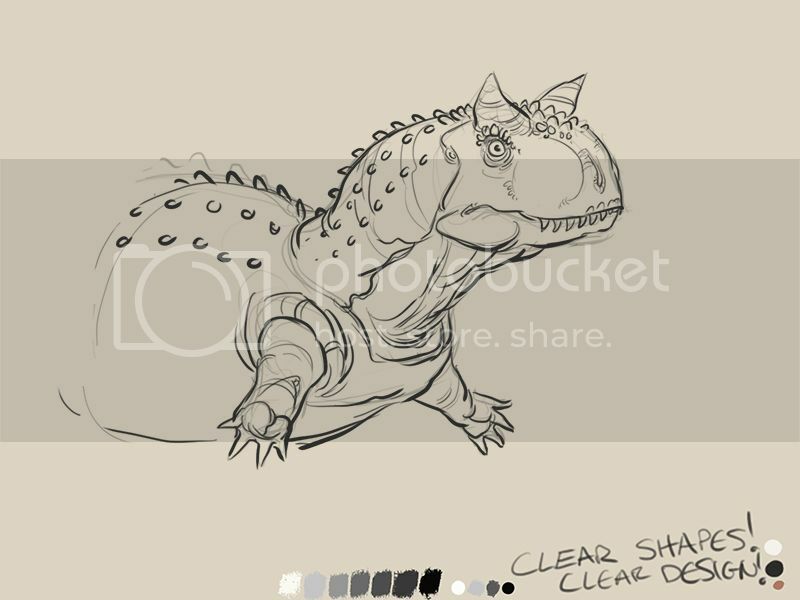 Took a quick look at Hartman's and GSP's skeletals for Carno..and either their wrong too or I just can't tell a difference in this type of drawing. I used Hartman's skeletal drawing for the basis for my Carnotaurus, so I'm definitely with you there, Blade-of-the-Moon. It looked like the hands were facing each other to me too. It seems to me that abelisaur arms are just bonkers regardless - supine, pronate, or neutral, they look silly. ....here is a politically correct photo of the "World's Greatest Entertainer" sans makeup - see what I mean?